Preschool, well it certainly appears as a big intimidating word, especially when you as a parent have just overcome the challenges of infancy and got accustomed to the mannerism of the toddlers. The preschools have turned to be extremely crucial in shaping up a child's future base. They are the new-age educational institutions for kids too young for the primary schools. Preschool provides them an environment to discover freely within the many spheres of development. These schools are highly recommended as the supplement to learning at home. Not just these schools focus on the academic development but even pay heed to introducing them to various social skills. They generally take in the children above 2 years of age; however, each school has different policy related to the age of admission. Everything sounds good but the main task is choosing the right preschool. After all, this is what will build your child's base and you surely don't want to compromise. Choosing the Right Preschool- But How? You can probably term this as the first prominent 'life-impacting' decision you as parent make for your kids, therefore, it is bound to be a little daunting. This can be a bit challenging but not stressful. Everything won't meet your needs. If some schools have good infra, there might be a lack of experienced staff. You will have to be clear with your thoughts and ideas about your child's initial educational requirement, and making the right choice won't be that difficult as it appears from top. This is the first step to take. Before proceeding with your hunt, first analyze what are your priorities. Seek answer for the basic questions like, whether you want a preschool near your house, or office, do you have a limitation of budget, what kind of atmosphere you want for the child, how long will the school hours be etc. In this manner, you will be clear with your idea and would hunt accordingly. This can be one great way of beginning the hunt. Interact with the parents in your circle, and seek references from them. Understand that what might suit them may not be apt for you and your child. This is just for understanding the basics, you don't have to always go by their feedback. Selecting a preschool isn't a cake walk. There are plenty of them in the market, each claiming to be the best and different from the other. Don't follow the marketing tactics blindly. Search online and gather reliable information. This data so collected will even help you in drawing a comparison between the schools. To what degree are the kids allowed to make their own choices about what they learn and when? 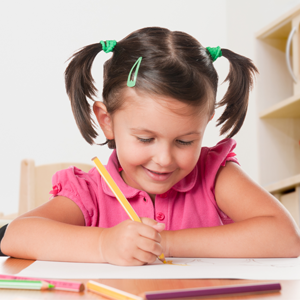 Is learning controlled or kids are allowed to show their creativity and learn independently? How they deal with discipline and other behavior aspects? It is very important to see if the school's environment, the people and activities are pleasing and the kinds suiting your child's personality? Get a feel of the teaching aids and play equipment that the school employs. Is there sufficient parent involvement? Parents these days want to be involved in their kids' school activities. Therefore, you must check if the school offers enough of parent involvement. Some of the schools work on the open door framework for the parents while some happen to be quite strict about parents paying a visit every now and then. You must also understand how the school management plans to keep you updated about your child's progress and what is their policy of interaction with the teachers. Go by your instinct ( the very first impulse you have when you walk into the school). If the atmosphere there seems warm and joyful, you can be sure of your choice. You can even ask for a school tour and observe each thing carefully to satisfy all your questions. The pictures on the notice board also give you enough clues about the school's philosophy. Be very thoughtful while making the search, and also, you must possess the needed knowledge about schools and their working so that you don't have to regret your decision afterward!